The Everglades – a huge, shallow sheet of water, a 150 km wide river, flowing from Lake Okeechobee in central Florida into the sea in Florida Bay. Mostly a sea of sawgrass, it is dotted with thousands of tiny islands – hammocks – made up of tropical trees and shrubs, and hung with curtains of Spanish moss. Deeper ponds are dug by alligators, focal points for Everglade life during the dry season, when much of the river of grass dries up. In deeper areas that remain wet, stands of spectacular swamp cypresses create a secret maze of channels and islands, the haunts of the Florida panther, a sub-species of puma, with only around 180 still surviving in the wild. Southern Florida was one of the last regions of the US to be settled and developed because these vast swamps were so difficult to conquer. But today, the whole eco-system is under severe threat. Land has been reclaimed for agriculture; large canals have been dug to divert water that is used to flow as the river of grass; chemicals sprayed on to the vast fields drain into what’s left of the Everglades. Hundreds of plants and animals have been introduced and thrive in Florida’s perfect climate. In the rainy season, roads turn black with walking catfish, originally from south-east Asia – as they can disperse over land, they colonised the whole of the Glades. Burmese pythons grow to huge sizes, big enough to eat alligators. And the list goes on. In 1947, Marjory Stoneman Douglas wrote ‘River of Grass’, one of America’s classics of nature writing. Her work did slow down the destruction of the Glades, but couldn’t halt it. Yet in 2000, Comprehensive Everglades Restoration Project (CERP) was signed into law. At $10.5 billion and with a 35 year time scale, this is the biggest such conservation project in the US, calling for a massive change in how South Florida is managed, including blocking of some of the major canals, to restore natural flooding. Half way through CERP, the film is an update on Douglas’ classic ‘River of Grass’, comparing then and now. The film will be both beautiful and poignant, as we see the threats to life here through the eyes of our two animal ‘hosts’, the panther and the alligator. 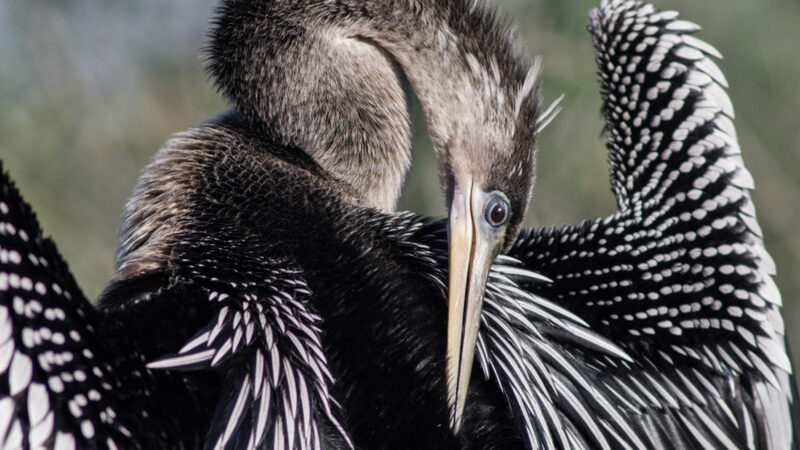 And we’ll ask – is CERP enough to restore the Everglades? Will the River of Grass continue to flow and to nurture its extraordinary and colourful diversity of life?